There is a serious debate on the internet about blog commenting, commenting systems and especially about Commentluv. Some say Commentluv doesn’t work, some say it worked but now it is out of fashion and it must be removed and replaced by other comment systems, especially by the new Google comment system. Other people say it works very well and it is still a very powerful tool for traffic and engagement. I didn’t write the article to support any of the two sides. However, I did want do know the real value of Commentluv. So I did an experiment. I installed Commentluv and used it for a whole month. In the following I will present the results so you can see for yourself the real value of the plugin. Is CommentLuv STILL an efficient tool for commenting? How much traffic and engagement can this plugin bring to a new blog? Blog posts for my links. I am a beginner. Not a total beginner but still a beginner. My blog started somewhere in March-April 2013. The experiment started on May 1 2013. Before that date I wrote 38 posts. 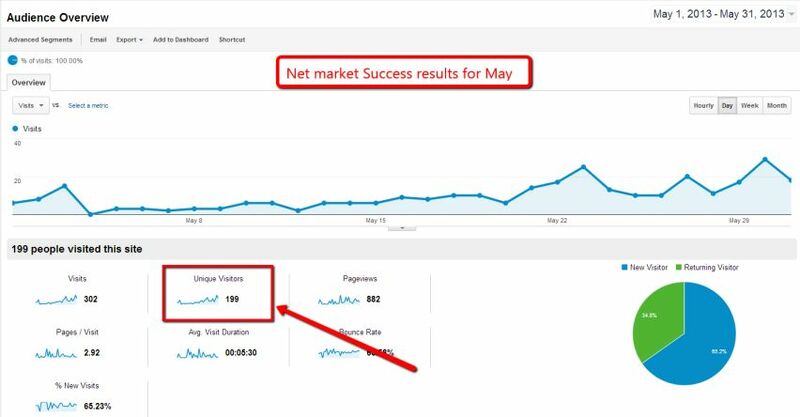 During May I wrote another 8 posts and promoted them on the blogs I commented (together with other 6 posts written in April). The total number or posts used is 14. Sites / blogs to comment? I took Anna’s list and checked it site by site, blog by blog. 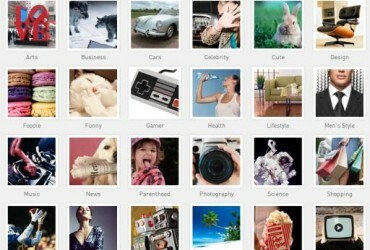 I chose only blogs with CommentLuv Premium, or free version installed. Also, I chose only dofollow blogs. On this list you will find other sites and blogs that do not have CommentLuv installed or are nofollow. I avoided these because my focus was to find out the maximum efficiency of the Commentluv plugin. So I used only blogs with the plugin installed. I checked the whole list and extracted about 25 – 30 still active blogs, from PR5 to PR1 and started to read their posts and make comments. I chose to make comments on 5 blogs a day, 6 days a week, from Monday to Saturday. I kept this frequency for the whole month of May. I didn’t make comments on Sundays. The method is very simple and popular. You choose an interesting post, read it, make a serious, thoughtful, valuable comment (the best you can) and post a link to one of the posts from your blog. Then you open a spreadsheet (I used Excell) and write the name of the post, the link of the post and the backlink to your post. Later you will check to see if the comment was approved and write this on the spreadsheet, too. 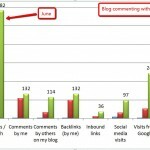 At the end of the experiment (June 1st), I counted all the numbers: posts, comments, backlinks etc. Then I opened my Google analytics account and wrote all the results (the same spreadsheet): traffic (visitors, per day, visitors per month, my comments, comments made by other people on my blog, backlinks, inbound links, social media visits and so on. My little spreadsheet with the results of the experiment. The traffic increased 8 times. The number of comments made by visitors on my blog increased 8 times. The number of backlinks increased 25 times. The number of inbound links increased 12 times. Social media visits increased almost 4 times. Visits from Google increased 13 times. The first problem is finding a post you can comment on. It is not as easy as it seems. You need to go to a blog, search, read and decide if you can comment or not. Sometimes I wasn’t able to find an interesting post to comment. Sometimes there were no updates so nothing to comment. When you cannot find something interesting on a blog you have to leave and check another one. That is the reason I chose 25 blogs. This was the only way to make sure I always have enough blogs to make those 5 daily comments. It is not so easy to make comments. You need to read the post carefully and understand the message. During the reading process I always write the main ideas of the post together with some interesting facts or data. At the end of the post I already know what to say in my comment. When you write, you have to be as careful and professional as when you write a blog post on your blog. Write your comment, structure it carefully, then read it once again. Did you succeed to make your point? Then you just read it one more time to find out and correct any mistakes. Then and only then you may post your comment. It was a surprise for me but you cannot simply put a link for the comment and leave. Usually the plugin chooses a link to your last blog post. This link may not be relevant for the respective article or you simply want to put another link there. With CommentLuv Premium it’s simple: you just tweet the post, or send it to your G+ or Facebook account and you will be granted access to a list with your last 10 posts. With the free version of the plugin … it depends. Sometimes the blog owner offers you the list with the 10 posts even from the beginning (I do this on my blog) but sometimes you have only the link to your last post available. 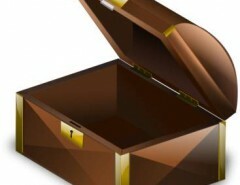 Losing comments: Sometimes the tweet, G+ or Facebook parts simply don’t work. You tweet, for example, the post but you are not taken back to the respective post and you lose the comment. Loading time: Another common problem is the loading time for a blog. Sometimes a blog loads so slow that you can see your beard growing. Finally you lose your patience and go for another blog. Page error: Another error encountered was “403 Forbidden Error Page”. No matter what you do you cannot comment on that blog. Comments with no links: This means your comment is accepted but your link is not. You get your comment but without the link. Fortunately, this is rare. Blogs that removed CommentLuv: I found a very important and powerful blog with thousands of articles and tenths of thousands of comments. I made about 8 comments on that blog, posted my links and got traffic and comments from that blog. However, at some point during month May, the owner of the blog decided to remove CommentLuv and replace it with Google commenting system. My comments remained on that blog but the links were lost. This “event” happened only once. Is CommentLuv STILL an efficient tool for commenting? YES !!! How much traffic and engagement can this plugin bring to a new blog? A LOT !!! The simple fact that I used CommentLuv plugin and made comments on other sites or blogs increased the traffic and engagement at least 8 times. CommentLuv might be one of the most powerful traffic and engagement tools available on the internet. Install the other highly praised comment system (Google comments) and test both systems for a while to see which works best. The final result may be surprising. My guess? You will use both. Diversify the type of the blogs where you make comments. Choose: blogs with CommentLuv installed, blogs without CommentlLuv installed, dofollow blogs, nofollow blogs etc. Don’t be so focused on posting links. Sometimes a blog with no plugin and just the native WP comments system installed might be more valuable because it can send you a lot of traffic. Focus on traffic and not on links. Your list of posts must be very diversified in terms of page rank. Do not limit yourself to blogs with high page ranks. Comment on blogs that have all the page ranks from 1 to 5. This was the first part of the test. The test continues for another month. Actually, it took me two months of tests to be convinced of the real value of CommentLuv. If you want to get the best results from your comments, increase exposure and protect from spam then you should try CommentLuv. If you understood the real power of CommentLuv, you may use the following link (affiliate link) to download it. I use it now because it gives me more powerful features and better results in terms of engagement, exposure and traffic. I hope this article helps. Now, it’s your turn to tell me about your blog commenting and CommentLuv experience. Silviu has been studying internet marketing for over 3 years. His aim is to identify the best internet marketing tools that can really help people succeed. Blog Comment Ingredients: How to Add Flavor to Your Post? Wow! I loved this complete and thorough analysis of CommentLuv. I love its features, but wondered a while back if it still had any use for me. I think I was wanting to get away from all the spam my blog gets, but I put the comment moderation back on and its been happy days ever since. With CommentLuv, its how I see new posts that I might not catch if I don’t visit their website. It does the advertising for me and it is not spammy. You can’t ask for more that that. Excellent write up Silviu! Thank you for the comment. CommentLuv is indeed a powerful tool. When you find such a tool you must to keep it as long as you can. However, we need to be prepare for any kind of change. So my next move is to test the other comment system, too. I guess the best way is to have both. So do I understand this correctly: turn the WordPress commenting system off and Comluv still works so Comluv users can still comment? Thank you for the comment. I have just checked your site. You seem a real person, use an avatar, have an About me page (rather strange page; why are you talking about yourself in the third person? ), you wrote many articles and got a few comments and replied to some of them. This should be enough for people to connect with you. But I am not sure … . You may be an honest man who works hard and fights for its piece of pie in a tough world or you may be a spammer who uses black hat techniques. At this stage I do not know, yet. However, the image you are projecting is what worries me. You created the image of a granite rock with sharp edges that you must avoid otherwise you will surely get cut. It is like you are saying: “Hey people! Look at me carefully. If you annoy me, I will give you a punch in the nose.” I don’t know why but you somehow communicate the idea of danger to people. You might have a huge experience, skills, knowledge and creativity. However, it is of no use, if people are afraid of you. Maybe you should invest a little bit of time and effort to make a better image. Now I am waiting for your reaction. It is very important because I really want to know who you are. Silvio you are downright prophetic! I like the granite analogy though it’s not so much image but more who I actually am. Maybe diamond in the rough? Jesus is working on me so we shall see. Thank you for your thoughts. Thank you for the comment. Well, it is obvious that you have knowledge and expertise, value and willpower. I also like the idea that Jesus is working on you. This means that the diamond in the rough will finally transform into a brilliant that will shine brightly in the world. However, if you work with Jesus, this means the diamond (meaning you) must radiate love. That’s because Jesus is love. Truth without love is not truth. Truth is Love. OK. I decided to accept you (by the way, I love and follow Jesus, too). You may come here anytime and you will have your link posted and dofollow. I will also come to your site and see what I can learn from you. I’m with Sonia…Wow! I use CommentLuv Premium myself and I love it. It’s got lots of extras that will make a blog more appealing like Top CommentLuvvers that show who your top commenters are….great stuff. Traffic to my blog has more than doubled from when I activated the plugin back in January. Welcome to my site. One of the things that I definitely don’t want to do is to go with the herd. I don’t care much about what people say. Even powerful influencers and internet marketers may screw things up or say stupid things from time to time. The most important thing is to use your own reason and logic to identify the real value of an idea. Even more. Always test a new idea, strategy, method, technique to see for yourself if it works or not. Armed with your own data and results you will be able to make better decisions. Thank you for taking the time to come to my site and make the comment. By the way, I like your site. Beautiful colors and layout. Talk about taking the extra mile! I admire how you analyzed this process. It’s incredible! I use Commentluv Premium and love it! I am not one to analyze things much, but since I have been using it, I get less spam, which is important to me, and do get new people coming to my blog. When you talk about comments you are spot on. You have commented on my blog and your comments are ALWAYS well thought out ones. I am sure people who read my blog notice you and you will get some folks to click on to your Commentluv to come to this blog. Donna Merrill invites you to read… People Should Know These Things! Thank you for your kind words. I like CommentLuv, too. It’s so ingenious and efficient. I simply cannot understand those people who remove it and replace it with Google comments. One of them, the owner of a powerful blog, admitted that CommentLuv helped her enormously to reach heights and it’s STILL working and it’s still bringing results. However, she replaced it with Google comments. I really don’t understand. When something works and gives results, why should you replace it with something totally new? I think it’s the internet version of lobbying politicians. One hopes that by using Google Comments they will give a little favor in rankings. Some have noticed the advantage of using Google+ for posting articles so maybe hope using another one of their products will be good. Just guessin’. Thank you for the comment. Trying all kind of comment systems is a good idea. However, when it comes to Google Plus I think it is more like … going with the herd. Plenty of arguments were give that showed the disadvantages of Gplus comment system. However, people rushed to Gplus because they saw some influencers doing this and they feared not to be left behind. I never liked this kind of behavior. However nothing can be done. In situations like this you just have to wait as the crowd will soon change direction. Good to see someone sharing the power of CommentLuv for bloggers. It’s always been a popular plug-in but with other commenting systems coming in, some people wanted the feel of more comments on their blogs instead of giving people link love. Now I do know that with other commenting systems you won’t get as much spam because people have to log into the system someway in order to leave a comment or they’re just left as a guest with no gravatar photo at all. One of the reasons these commenting systems still aren’t very popular with me. Now with Google+ coming on the scene, just like Facebook they’re trying to get their leg up with bloggers. Here’s the issue I have with that. Your comments are now on their sites and not yours. Oh sure, you’ll see them here but trust me, they “own” that part of your blog because if for some reason they chose to delete your account tomorrow, there go all your comments. Now that just doesn’t sound very appealing to me does it to you? CommentLuv rocks and I can’t see myself getting rid of that plug-in anytime in the near future. Andy is going out of his way to improve the premium version so that we can cut down on even more spam as we continue on. I have no doubt he’ll keep coming up with ways around those suckers. Thanks for doing this comparison and proving to everyone still how powerful CommentLuv truly is. Thank you for the comment. With GooglePlus your comments are not yours, indeed. Good to know this. Also, it is about Google. Google must exist because it’s useful but cannot be trusted. They turn like the wind, according to their interests. I do hope that Andy will be safe many years from now and be able to maintain the plugin. However, because I like to test things, I will test Google comments, too. If it works I’ll keep them both. If not, CommentLuv will do. Wow, this is a brilliant case study on CommentLuv and thank you for sharing your results. It’s really interesting to know how much impact the plugin has made on your traffic and engagement. As much as I love the look of Google+ Comments, there are too many things against it for me to switch. I wouldn’t like to have two commenting systems on my blog either as I think it gets too confusing. Keeping the WordPress comments system isn’t second best for me though as I think with CommentLuv installed, it’s still the best option. With Andy working on cutting out even more spam for us, I’m fully behind CommentLuv and will be in the future. 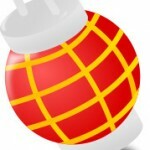 Tim Bonner invites you to read… Google+ WordPress Comments – Time For A Change? Thank you for your comment. I agree CommentLuv is the best option. However, I will search to find the effect of installing the second system to the speed of my site. I like to test things so if everything is OK and the loading time is not so much affected, I will install G+ comments and have them both on different tabs, using one of the plugins you recommended. These are attractive ingredients that still make commentluv the #1 choice. You know (and thanks for the brilliant comments on my blog), I’m doing an experiment on my blog with commentluv, Google+ comment and Facebook. As of date, Commentluv keeps seducing my visitors. Googl+ comes second and Facebook is almost completely lost. Enstine Muki invites you to read… $150 Paypal Cash Giveaway! Thank you for the comment. I like the way you accepted my comments despite the fact they were not positive all the time. You are a powerful blogger. I can see this from the way things are going on with your blog. You wrote a lot of articles and now you are hosting guest posts. You work hard but you managed to remain warm and friendly. This is the mark of a powerful blogger. You are or will be a leader. I am glad that I met you. CommentLuv is very effective especially in the hands of a blogger like you. You developed and implemented a commenting strategy. You didn’t just install the plugin and expect it to work. Every time that you leave a well thought-out comment that adds value to the blog you visit, you build your brand and your authority. (I had no idea that your blog was as new as it is. I’m guessing that you found my blog through Ana Hoffman’s list.) You’ve accomplished a lot in a relatively short period of time and by writing this post, you’ve provided many of your readers with a “road map” of sorts. Great job! Bottom line, CommentLuv is still a very effective tool. It is a tool though and not a substitute for thinking strategically and analyzing your results. Thank you for your comment and for your nice words. You have hit the bulls eye. CommentLuv is a very effective tool BUT without a strategy to use, it will not produce quality results. Any new traffic and engagement tool you find must be analysed in order to design a strategy that’s specific for that tool and for the person who uses the tool. This is what I did with CommentLuv. I will do the same with any other tool. I didn’t remember exactly where I found your site. Maybe through Anna’s list or maybe through Adrienne Smith’s site. My blog is new, indeed but it is not my first blog. It’s just a blog that I launched because I like the domain. My previous domain/niche – for example – was weight loss. I created another blog in this niche for study purposes and I wrote about 240 articles on that blog. Now I use it rarely, when I want to test something, to learn something. Wow Silviu – very analtyical. I knew I got a lot more comments and shares since using the CommentLuv premium – I’ve had it at least 6 months now and really LOVE it! I also love the support Andy gives to us. If I thought of using the Google+ system, I know I would not be able to reach anyone there quickly and get a response like Andy does so well. I could see myself using both MAYBE in the future. I’m watching the others using it now. But I’m not leaving CommentLuv. Great analysis Silviu! Thank you. Thank you for the comment and kind words. I think you should always use the best weapons at hand and test for yourself to see the new ones that appear. To me Googleplus comments is still too new and I do not know enough about it. I will wait for a while to see what happens. Even if decide to install G+ comments this will not affect CommentLuv. You HAVE to keep what works and this plugin definitely works. As others have said WOW, that’s probably one of the best posts I’ve seen breaking down results and giving true readings. I love commentluv premium and the fact that I was able to lose other plugins as ComLuv does there jobs as well. I think it covers 8 plugins in total, but the more features Andy adds means we can lose more over time. I’ve seen a few posts about the new Google plus comments system and I think I’ll stick with commentluv. As your post details we DO get some fantastic results from it. Barry Wells invites you to read… Be Seen But Be Safe, Get The Picture? Thank you for the comment. I liked your site from the beginning: substance, how to, new ideas, visual appearance you have it all. The layout of your site and the colours make me a little bit envious. Summary: valuable content, beauty and experience. Barry, I need to learn from you. 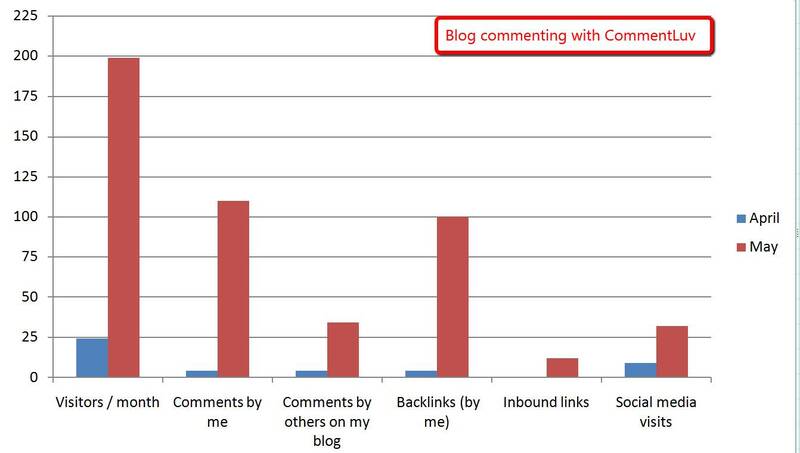 The debate about blog commenting being an effective tool for Traffic generation and backlinks will forever be on. I use commentluv on my blogs and I am so in love with it especially with all the combo that comes with the premium version and I have no plans to remove it any soon. Thumbs up for taking your time to come up with this expeeiment and result. Thank you for your comment. A debate is always good. It helps you find out the good and the bad about a products, site, system etc. I like CommentLuv and I have no intention to replace it anytime soon. I went to your site, BloggingTipsToday. Great job. I like what you said: “No one is an Island of knowledge”. You know what? I like the blog. You two guys are cool. Thumbs up and a lot of money for you! I have posted blog articles on my website and on other websites (like blogspot) and have decided that posting them on my site was better because I have control over the articles and when they visit my website I can see the stats. Either way, however, I have a really difficult time getting readership, probably because of the subject matter. No one really cares about their computer until the computer dies; no one really cares that they have strong passwords until they get hacked, and no one really cares about how to prevent problems with their computer until they have a problem. My blog is at http://glickscomputerrepair.com/category/blog/ and I would love some suggestions on how to get more readers. Certainly CommentLuv seems like a great idea and I am definitely going to look into it! Thank you for the comment and Welcome to my blog. I checked your site. Impressive profile, nice picture, clear identity and huge experience in the field. You are serious and professional, you know what you want and deserve respect and success. I am glad that you came here and made that comment. Computer specialists like you are very important for any business. I am happy I met the first one online, here at my site. Obviously you understand the need to advertise your business and you are surfing the net, doing research and offering tips to help people with their hardware. Awesome! Whenever I will be asked a question about hard drive issues, I will send that person to you. One more thing. There are some topics that are important for any computer user. Let me try brainstorm some ideas: maintaining your computer is one of them. On the hardware part you know better On the software part you may try to promote software that cleans your hard drive, like Ccleaner for example. A better idea is computer security. This is a hot topic and people are very … “sensitive” to it. You may teach people how to protect their data from crashes and from being stolen (external hard drives and other solutions). Constantly use the word security and tell people stories about computer users who lost everything they had and affected their business because they didn’t pay attention to the security problem. Another security related issue is spam. Spam is a scary word and you may research, identify and test anti spam software on your devices. Data recovery may be another interesting domain. For the moment, these are the only topics I can come with. Thank you very much again for visiting my site. I am definitely with you, Silviu – CL still works great for engagement. The only reason I disabled it on my blog was because I was too lazy to fix hundreds of broken CL links. If I could make a suggestion: I think you’d benefit greatly from linking out to other people more often. 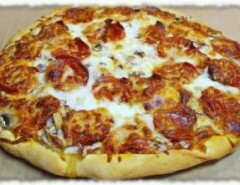 It brings traffic and builds relationships. Thank you for the comment. Broken links? This is indeed a something to take into account. Some research must be done here, too. There must be a way, a simple strategy to fix those broken links. Why do you say “linking out to other people more often”. Is the number of comments too low? The site is new: about two months. There is a plugin called Broken Link Checker that has a radio button for “Stop search engines from following broken links” which I suppose inserts rel=”nofollow”. I haven’t had any broken links yet so don’t know how well it works. Very interesting analysis with graphs. Commentluv is very useful. You could have used sites that were in your niche to make it more specific. Thank you for your comment. I will do that in the future. Nice job with this case study. I appreciate the time and effort you put into this. It’s reassuring to see the benefits spelled out this way. That is a great study case but today many blogs has nofollow link for their commentluv so I don’t know it will be increased a SERP or not … . Yes, but in this case study I only used Commentluv enabled blogs dofollow. You will definitely see an increase in your SERPS. It sure doesn’t read like you’re a beginner. But thank you for taking the time to perform an analytical approach toward the benefits of CL and non-CL sites. I used to use it on my site until I ran out of relevant sites that would reciprocate. I rather moved on to third party services for my commenting. The social conversation and discussion is more valuable to me than a backlink. Thank you for the comment. You are probably right. However, I won’t give up backlinks. I want then both: social conversation and backlinks. I’m sorry to inform you but the images on your site don’t work. I don’t know what happens. They are not loading up. Not even one. WOW! Impressive list of decorations and medals, sir! Very interesting post you got here Silviu. I think im going to follow your technique. I have been loosing traffic since feb 2013. Believe it or not I lost around 70% of my original traffic. By the way how many comment do you leave per blog and do you comment on commentluv enabled blogs but are nofollow? And do you leave comment on the same blog for several weeks? Hope to read you reply. Thanks! Thank you for the comment. I leave 1 comment per blog and most of my blogs are commentluv enabled and do follow. Also, I comment on some big blogs that do not use commentluv. This is the next move. You need to have a mixture of blogs: commentluv, without commentluv, dofollow and nofollow. Now, I would like to know a thing. What’s your real name : Peter, Paul or Jeff? I checked your site but in vain. There is no about me page and no information about you. Also, I checked the facebook page. No info about you. This is strange. I don’t know anything about the person I talk. Usually this is the mark of a spammer. I approved this comment but I won’t approve the rest until I know who you are. My real name is Peter Paul. Jeff is my nickname. Sorry about that. I used Peter Paul since I noticed that when I leave a comments on other blogs with just the name “Jeff” there is a big possibility that they don’t approve it. I don’t know why. No I’m not a spammer. 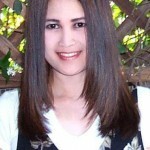 I didn’t include an author bio from my blog since I am still testing the theme. As you have noticed my site is plain and not crowded compared to other technology blog site. I’m trying to make the site load faster, since I transferred web hosting from WP Engine. Thank you for replying to my comment. I really appreciate it. I rarely get replies nowadays, specially when I throw some questions. Thank you for the info. I believe you. It’s OK now. I usually reply to all the comments. Except those who are obviously made for getting the link. When I see such a comment I usually not approve it or remove the luv. Right now many people are switching from commentluv to google plus comments & even Ana whose list you have used has taken the switch. I think commentluv is an amazing commenting system for new blogs as many people will comment on your blog for backlinks. Thus improving the interactions on the site. For established it was resulting in some problem like broken links and spam. This was one of the main reasons behind the switchs. Also Google Plus system can play big role ahead who knows the way SEO is changing and as google plus is getting more and more important it might be used to check the response to author’s posts in future? BTW nice case study. I can truly see the winner here. I am also using commentluv on my new blogs. Another thing can you share the shortlisted blogs? Thank you for your comment. I’m glad to meet you. You seem such a nice guy. I know that many people switch from commentluv to googleplus comments. There is a whole debate on the internet about this. I participated in the debate with my little case study. I am always very careful at one thing: The crowd’s actions. I don’t like to go with the crowd. When you do what everybody does you’ll get the same results everybody gets. Broken links and spam? So what. Do you think G+ is perfect? There are so many things to talk and so little space in this comment. Excellent case study! I have been hearing that blog commenting is still effective (traffic purposes) and am conducting a case study of my own. I like commenting for guest posting opportunities, among other things. Thank you for the comment. Nothing is perfect on this world. However, commentluv is a great tool and I will keep it. Glad to see a real world comparison of Commentluv versus the Google comments. I was thinking that Google would give more SEO juice to websites using their comment system. I wonder if you made comments on both do follow and no follow sites if there would have been any difference? Probably not as far as traffic but what about for SEO purposes? As far as I know it is not a good idea to comment only on dofollow sites. In terms of SEO I think it helps to comment both dofolow and nofollow. Otherwise you will look like just another link hunter. The best strategy would be to comment on all type of sites: commentluv, no commentluv, dofollow, nofollow etc. I love your reply to Mark right above this Silviu. As someone who’s never had a commenting strategy outside of commenting only on posts where I admire the content and wish to acknowledge the writer and I feel I can contribute something to the conversation going on, it seems that I’ve kept myself from being seen as a Link Hunter. Hell, I don’t even fully understand “do follow” and “do not follow” and how to tell which one a blog’s commenting section is set up as. For me, my number one reason for commenting on a site is starting a relationship with the blog owner. For me, cultivating relationships is far more important than getting my one little back link from the post. I know that one guest post or direct link to my site from an awesome blogger will bring me far more traffic and authority than will my links in the comments sections of blogs. And it works. I’ve been acknowledged lately by mega super stars like Chris Ducker, Joe Pulizzi over at the Content Marketing Institute, and Brian Solis for leaving comments on their blogs that could serve as blog posts and I have indeed turned two of those three comments into posts for my site. I might not ever pursue working with or co-creating anything with any blog owners, but I want to rest assured that I’ve made a memorable impression and I’m perfectly fine with only having done that. If I was ever really serious about getting front and center on their radar I’d crank things up a notch by taking something specific that they teach (preferably from a product or book of theirs because customers who take action always get preferential treatment), experiment with it, track my results and then write up a case study and send it to them praising them and their wisdom. Anyone who does this, will find it almost impossible to get the attention of a superstar. And speaking of experiments, I honor you Silviu for testing and tracking your results and sharing them here so that we all get some concrete advice on what this tactic can actually do for our blogs. I always appreciate when someone goes beyond theory and speaks to tested, proven and actionable ideas. PS. Thank you for the ReTweet on the “How To Read a Book In 15 Minutes” post of mine. Thank you for the comment. Definitely you are not a link hunter. On the contrary, you seem an expert in blog comments. Also your creative power seems deeply rooted in the writing area. You like to write. I like this gift of yours. I agree. What matters is to create relationships first. Thanks for the idea of commenting on powerful blogs. I will meditate on this. Now, one thing I don’t like is to trace the footsteps of superstars. Of course, I’m interested in experts in different domains, influencers, powerful bloggers, artists etc. However, I go to their sites to find out ideas, strategies, techniques and to study their writing style. I don’t like to praise them. Not a bit. On the contrary, whenever I see a superstar that says or promotes something stupid I cannot help but telling him or her about that. Usually they ignore me but this doesn’t matter. My consciousness is clear and I was honest and told them the truth. They are superstars? So what? If they are not authentic and true, they will fall. When I praise somebody it’s because I really like what they say or do. Dofollow ? Nofollow? These are just for SEO purposes. Dofollow links are counted by Google (for ranking purposes) while nofollow links are not counted but they matter because they bring traffic. Usually nofollow blogs are big blogs and they can bring you a lot of traffic and this compensates the fact that you cannot put links or the links doesn’t matter. I’m very glad to meet you. 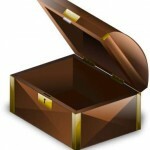 I’ll arrive to your site as soon as possible and I can hardly wait to see your message to the world. Thank you for this thorough and awesome analysis! I believe I’m going to put together a similar strategy now that I’ve seen this one in action. The raw numbers were quite awesome. Also, I totally agree with you about the difficulty, occasionally, of finding stuff to comment on (or even things worth saying that make good comments). Keeping track with a spreadsheet was a particularly great idea. Welcome to my site and thank you for the comment. Yes, it is difficult sometimes to find good articles to comment on. However, if you make a habit from visiting powerful blogs with high PR and a lot of guest posts, you will always find something worthy to comment. It doesn’t matter what you use to record and track what you do. What matters is to do it. Tracking what you do is an absolute must, otherwise you will soon get lost in your own actions. You have shown empirically what most marketers have found to be the case in actual experience. Comment Luv has so many great ways to enhance the conversational side of our blogs. I’m so glad you could illustrate why its value more clearly is indisputable. Welcome to my site and thank you for the comment. Yes, this plugin is a little treasure. However, it’s just a tool. What matters is the person behind the comments. I must say that you definitely have a very interesting site. It is very rational, organized, actual. WOW! You write like a man, a real man. What an amazing piece of research – which confirms my own belief and experience that Commentluv is a great tool. My only reservation about it is the fact that it encourages some people to leave poor value comments, just for the sake of getting a backlink – and, like Ana, I find the broken links a real pain to deal with. I’ve become much more selective about which Commentluv links I’ll approve – I tend to remove them, for example, if they’re to a post that’s just about downloading some software, as these are bound to go out of date. I don’t really like it when people have more than one comment system running on their sites – I know a few people have Google+ alongside WP comments and CommentLuv, but I think it’s confusing – better to decide on one system and stick with it. Sue Neal invites you to read… Are Your Blog Posts Missing This Vital Ingredient? Thank you for the comment. It encourages some people, indeed, to leave poor comments. However, this is the way I gain experience with comments, too. Now it is much easier to identify a spam or a useless comment than it was before. When somebody leaves a poor comment you have, of course, two options: delete it or remove the luv. Broken links may be a problem, agree. I think if you check your links, from time to time (at least once per week) you will avoid the headache. The problem is not just broken links. The problem is the accumulation of broken links. If you check them weekly, this will never happen. Is your background in research?…this is a very detailed account of all the intricate parts to commenting on blogs with comment luv. It was also very interesting to learn how you went about doing this research. I’m not sure I’d go that far but you did measure your results so you know exactly where you stand and what’s working…kudos for having the patience to do this. It looks like you are on your way. 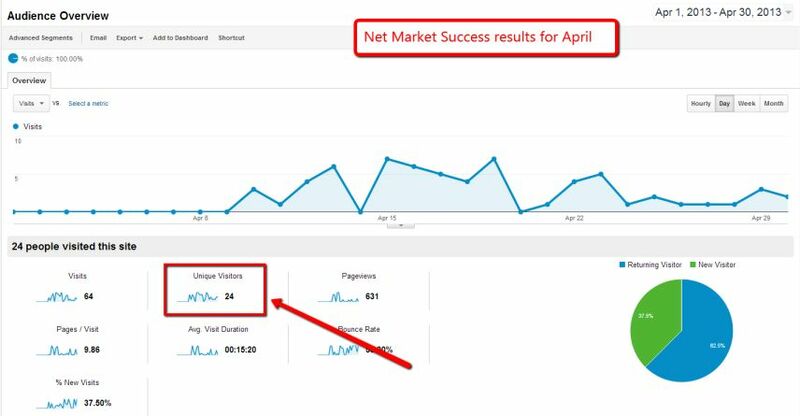 Your traffic is picking up and I loved seeing those comparisons from month to month. Will you give us another update in a few months? Welcome to my blog. Thank you for the comment. No, my background is not research. I am a teacher. 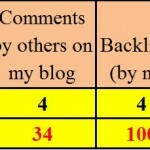 As for the update, I have already posted the second update on this site: Blog Commenting Results Case study 2. All of the backlink and exposure from commenting on sites has been greatly devalued by Google. What other means can a commenting system make for good visibility? If blog commenting is dead, then guest posting is dead, too. If guest posting is dead, then blogs are dead, too. Now, the belief that social media is the only way that remains to get traffic is a big mistake. I don’t want to make it. For the moment, I stick with what brings results. Blog commenting brought me results. Social media brought me just disappointments. How do you know backlinks and exposure from commenting on sites has been greatly devalued by Google? As far as I am concerned, Google itself has been greatly devalued as a mean of getting traffic. I don’t want to spend the rest of my life praying to Google like some kind of god. I want different sources of traffic and I will never put my eggs into one basket. Oh crap! You really nailed it with all the detailed etc. Crazy but epic! You had proven a great point especially with using commentluv etc. Personally, I still think CommentLuv is a great deal. I mean who can deny that right? On plugin wise, Andy is doing hell of a job to get the plugin updated and GASP working. The only small issue is when you are targetted by a truck load of spammers. Just need to see how lucky you are. Nonetheless, I found it very effective running CommentLuv with akismet and GASP. Sounds lame but hey that make my spammer go nuts. Haha! Excellrnt write and keep it up! Thank you for the comment. I am glad you liked my test. However, that was only the first part. You can see the second part of the test when you click on the link in this reply. Well, before CommentLuv Premium there were about 50 spamm messages a day or more. After I installed and configured CommentLuv, GASP and AntiBacklink and I created a restrictive blog commenting and anti-spam policy the spam disappeared. Totally! Zero spam. Akismet? I used it but after all that internet talking about Akismet marking genuine comments as spam, I decided to uninstall it. I do think that Akismet does a good job but I don’t want to take any chances. I personally love taking advice from mentors who are doing well in that niche. Notable bloggers have used the power of commentluv to dominate Google’s first page, and I’m seriously studying this trend. I aim to do likewise with a view of establishing an engaging community around my blog like Adrienne, Reginaldchan, Mitz of letsbuildwebsites, Yeremi Akpan e.t.c. Thanks for sharing, the stats are encouraging. Thank you for the comment. Your idea is very good. Do it and you will succeed. This is an EXCELLENT post. Base from your own research and experiment, I mean who can beat that? You have done an AMAZING job. I have CommentLuv Premium and loved it. Can’t blog without it. Andy Bailey has done an amazing job kicking the rear of spammers. Ever since I added “Anti Backlink” my spammers cut down 98.9% and I’m pretty happy about this plugin. Btw, I’m with Adrienne as far as Google comment is concerned. She is right. Once you use their commenting system they own your comment and not you. I want to have FULL CONTROL of my blog AND comments. Not just my blog. I’m serious about keeping my comments. I’m with Tim Bonner as well. Having 2 commenting system on my blog might be way too confusing for my readers and audience specially the beginners. And so I’m not going to put two but only ONE and that is the only one — CommentLuv Premium thru my WordPress. Also, I’m with Sue Neal. I can understand what she’s saying when just anybody can leave a comment without any value whatsoever. In fact, I have one commenter who just leaves me thread of “no value” comments like, “Hey, how are you?” “I hope you have sweet dreams” “See you later” I mean all spread apart like that right? Using my comment window like a FORUM. And then this person appears in my “Top CommenLuvvers.” Men, I just hate that. I almost wanted to DELETE the “Top CommenLuvvers” OFF of my widget just because someone wants to take advantage of being on TOP there without contributing anything to my post. Other than this, CommentLuv Premium is EXCELLENT and you have done a SUPER job doing your own research on this. Kudos to you my friend. Thank you so much for sharing this research with us. Thank you for the comment. Yes, you are right. There is no need to mess a blog with two comment systems. The problem: “who owns the comments and who is in control” is very important. I like to be in full control of what I am doing here. Your problem with the Top Commentluvers widget is interesting. Well, some people just want to take advantage of any opportunity that arises. Fortunately, it is very easy to deal with this small issue. You can decide who you want to appear on that section and who not. The widgets has this option of blocking a particular person to appear there. I have already used it to block myself from appearing there. You can accept comments from a person but keep that person out of the top Commentluvers widget. Is that right? I didn’t know you can block people from appearing there. I want to block myself from appearing on that Top CommentLuvvers. How do you do that? I want to block hose who doesn’t give or add value to my post. I want to return the favor to those who really put the effort leaving me quality comment. Thank you for the comment. Yes, you can block people from appearing in that section. First time when I used that widget, I found myself on the top. I was the best of the best with hundreds of comments there (LOL!!!). So I took action quickly and blocked my name for appearing there. Appearance – Widgets – Top CommentLuvers. Check your user profile to see what name you have there. Put that name in the respective field and … it is done. Thank you on the tips on how to do this. I appreciate this very much. Btw, I forgot to ask you, how do you know these people are CommentLuv Premium users? Doesn’t the FREE version allows you to have a “link” there too? I don’t remember. It’s been awhile. Thank you for the comment. At this moment I have no idea how to tell your commentators are CommentLuv Premium users. The free version does not use Top CommentLuvers widget. I think this is a question for Andy Bailey. When I find out, I will tell you, of course. I am curious. When I read your article (about Hummingbird), you have the image of a bird there. It is not a static image, it is not a video. It is a dynamic image. A bird that flies. I like very much the idea. What is that and how did you do it? To answer your question, that hummingbird is a GIF. I believe there are some photo editor like Photoshop where you can animate the photo. I don’t know how to do it. In fact that animated GIF I have borrowed from one of the Google+ user, I have actually credited the guy below my post. I think the software Adobe Flash can help you animate an image. Or if you google “how to animate an image what software to use” it will give you information as well as pointing you what software to use. Thank you for the tip. I now understand: it is an animated gif. This was the most important thing to know. Now, I just need to find a way to make those animated gifs. Thank you. This was a fantastic post. I’ve recently jumped into commenting very heavily. I find that it’s a great way to meet people and learn new things. I started out the same way you did with a list. From there I started following peoples links that they left in comments to their sites. That’s actually how I found yours. Anyway, I really love how you set everything up. From the spreadsheet with your comments to the graphs showing your results. This post was very easy to follow, and solidifies my own thoughts about commenting and commentluv. Thank you for the comment. Nice to meet you. Well, after checking your site, I can see that you are a serious person, a professional who started his own business and is climbing the ladder of success towards the body building peak. Awesome! Now Al, this is an internet marketing blog. One of the things that a blog owner must be careful is the niches of the sites that links to his blog or where he wants to link to. Normally, it must be in the same niche or in a closely related niche. Well, if you want to connect with this type of blogs, you need to have something on your site to which they can relate to. You must have a category, at least, that relates to internet marketing or other subdomains. You created a page: “Make money”, but it is empty. So, my honest advice to you is to make a category related to online marketing or develop the one that you started (Make money). This way we can relate to your site, make comments and accept comments from you. Thanks for this post Silviu. I love your analytical approach. As pointed out in one of the comments above CommentLuv is really just a tool, but it is a fantastic tool as long as you take consistent and regular action. I like your approach of concentrating on a handful of blogs and actually trying to build a relationship with the blog owner through the comments you leave. Thank you for the comment. Yes, blog commenting is a powerful technique. When combined with other methods like quality content and quest posting, it can really bring you a lot of traffic. Yes, I am aware of that search engine on the Comluv blog. However, I haven’t use it much. Maybe in the future. One of the few analytical approaches to CL effectiveness that I’ve seen, Silviu so way cool mate! I’ve been using CLP on my PR4 for years now but I must admit I have wondered on the traffic side of things but never got around to doing the GA stats. I have pointed out to others on another one of my low traffic blogs that KeywordLuv should be used with great caution since I was slapped with a Google ban and KWL ended up being the culprit. I might give your approach a go myself. Thanks again for the share and info. Thank you for the comment and Welcome to my site. Yes, CommentLuv free version is effective. However, the free version is only a fraction of the Premium version. CommentLuv premium offers a huge amount of control on your blog from comments and links to spam. By the way, I was seriously spammed before ComemntLuv: 50-100 spams a day. In jut 1-2 days after installed CommentLuv premium I got rid of the spam. All of it. I honestly think that with a combination of CommentLuv, GASP, Antibacklink , security plugins and a well designed blog commenting and anti-spam policy, you can reduce the spamming to zero and in the same time keep the quality of comments high. This means more social proof, quality comments, more trust and a higher level of engagement on the site on the long run. Blog security is one of my main area of interest. For the moment I am interested in blog comments and how they can bring benefits to a site or blog. I constantly research and write articles about this in an effort to gather enough data to write an ebook about blog comments. I hope it will appear this year. The next step will be to research and design an anti-spam strategy and policy that will keep my blog secure. Another book about anti-spam strategies will appear, probably next year. KeywordLuv? I rarely use keywordluv on other sites and here I avoid it completely, for the same reason like you. Great analysis Silviu! I have had the Comment Luv premium plugin since Andy released it. It is the best plugin I have because it helps me quickly delete spam comments off my site and stops evil spam bot backlinkers. I need to have the dedication that you have and go and make my 5 comments a day to help bring my site more targeted traffic! Thank you for the comment and Welcome to my site. You had a very good idea to create that site and start offering people your knowledge and expertise. Your Air Force training can be seen in the way you think, speak, organize things and even in the way you look. I like educated, organized people who can focus on a task until completion. You had a great start and have a whole organization behind you. This is excellent. Great way to improve your training and create a network of connections that leads to success. Congratulations. I also like the fact that you based your life and work on values. You go to Church, listen to classical music, love nature and have a definite and strong interest in the spiritual realm. This is a strong foundation for business and internet marketing as this ensures the respective person will be honest, sincere and offer real help with no hidden agenda. I am glad you came here and made a comment. I think you have everything you need to be successful and you will surely be.